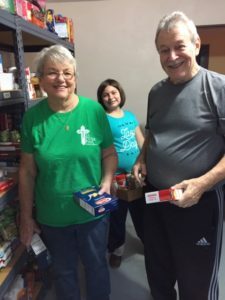 Teams of two Vincentians deliver food from the Society of St. Vincent de Paul Food Pantry, located in Morris Hall, to needy people in the community who call in for help and who have disabilities and/or no transportation. 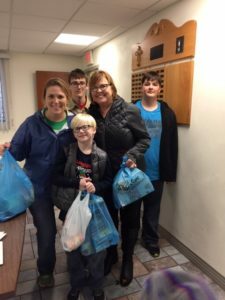 Deliver food orders from the Collinsville Food Pantry (CFP) to clients with disabilities and/or no transportation. Help pay power bills of people who are in danger of power shut offs and who are referred to SSVDP by the Collinsville Food Pantry (CFP). Refer clients to other organizations and charities when SSVDP cannot help them. Purchase items needed by other community programs, such as Ladies’ Auxiliary Tote Me Home Program, Collinsville Township Back to School Program, St. John’s Summer Program for Kids, R.E.A.C.H. summer feeding program for kids in State Park and others when requested and approved by members. SSVDP needs your continued support. With your generous donations, the SSVDP served 3,580 people last year. SSVDP needs volunteers to deliver food to the needy and to organize the pantry. Parishioners are encouraged to attend a meeting to see if working with this ministry interests you.